There is so much information on basic survival skills that you might be asking "Where to start?" Here are 6 primary components of wilderness survival to help you thrive in any situation. More than any other skill, your attitude determines how successful you are in a survival situation. This first of the basic survival skills might even determine whether you live or die! The "Rule of Threes" provides a guideline of how to prioritize basic survival skills: first shelter, then water, and lastly food. By systematically assessing, planning, and executing your basic survival skills, you will help keep your mind and body actively engaged in addressing your situation. This will greatly aid in avoiding panic and other negative states of mind. By upholding an upright attitude, your chances of survival are greatly improved! There are many types of shelters to consider including natural shelters such as caves, hollow stumps and logs, as well as building shelters such as a debris hut, lean-to, debris tipi, scout pit or snow shelter. Of the shelters listed, the debris hut is often the most practical to construct in almost any environment. Learn how to construct a debris hut. Since the human body is composed of up to 78% water, it should be no surprise that water is higher on the list than fire or food. Ideally, a person should drink about a gallon of water per day. Many lost persons perish due to dehydration, and/or the debilitating effects of water-born pathogens from untreated water. In addition to water-borne pathogens, minerals and metals can be found in waters downstream from industrial and agricultural operations. The best sources for clean drinking water in a wilderness setting are springs, head-water streams, and collecting morning dew. Popular modern methods for purifying/treating water include filtering pumps and chemical treatments, such as iodine. These can be efficient and effective solutions if you have access to these items in a survival situation. An herbal treatment is another method in which water may be purified from viruses and bacteria. Grapefruit seed extract is sold as a water purifier, although there is some debate on whether or not it is one hundred percent effective. The most widely used and proven method for safely purifying water is boiling. Bringing water to a boil and allowing it to continue to boil for 2-3 minutes will kill bacteria and viruses. By maintaining a level attitude, creating a shelter, and obtaining clean water, a person can successfully survive for many weeks. Even though it is not directly a survival need, fire is one of the most useful basic survival skills. It can help warm your body or your shelter, dry your clothes, boil your water, and cook your food. Also, fire can provide psychological support in a survival situation, creating a sense of security and safety. Ideally, when traveling in the wilderness, it is best to carry multiple fire-starting tools, such as a lighter, matches, flint and steel, etc… Even with these implements starting a fire can be challenging in inclement weather. 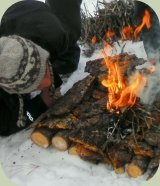 We highly recommend practicing fire starting in different weather conditions within different habitats. Good fire-making skills are invaluable. If you were to find yourself in a situation without a modern fire-making implement, fire by friction is the most effective primitive technique. Popular friction fire-making methods include bow drill, hand drill, fire plow, and fire saw. Learn how to build a fire using the bow and drill friction fire technique. You might be surprised to see food so low on the basic survival skills priorities list, though we can survive for much longer without it as compared with shelter and water. Remember "The Rule of Threes": humans can survive without food for roughly 3 weeks (though I'm sure you would not want to go that long without food!). Thankfully, most natural environments are filled with a variety of items that can meet our nutritional needs. Wild plants often provide the most readily available foods, though insects and small wild game can also support our dietary needs in a survival situation. Be sure that you properly identify any plant you plan on consuming (using field guides and/or the guidance of an experienced expert). Many plants can be difficult to identify and some edible plants have poisonous look-a-likes. If you cannot identify the plant, do not eat it. The more you know about nature, the better you will be able to survive in the outdoors. To be great at wilderness survival, beyond the basic survival skills, requires an in-depth understanding of a variety of nature skills. For example, wildlife tracking skills allow one to effectively locate wild game for food, and knowledge of herbal medicine allows one to heal illnesses with wild plants. Especially for the situation where you may choose to purposefully practice survival living for a lengthened period of time, naturalist knowledge is absolutely invaluable. All of our hunter–gatherer ancestors had classification systems for living organisms, knew their names, understood their uses, recognized how they inter-related to each other, and were aware of exactly how to utilize those resources in a sustainable fashion. This knowledge was at the foundation of their ability to thrive within the natural environment. For even the recreational wilderness skills practitioner, a basic knowledge of the natural sciences (such as botany, ecology, geology, etc…) can be very useful and enriching. A great place to start is by purchasing the relevant plant and animal field guides for your region. These resources can help you begin to identify species and understand how they relate. Now, with these six keys to basic survival skills, you are well on your way to thriving in the outdoors!